Justin and Libby Denbe have it all: a beautiful daughter; a gorgeous house; a great marriage, admired by all. Arriving at the crime scene of their home, investigator Tessa Leoni finds no witnesses, no ransom demands or motive - just a perfect little family, gone. But Tessa knows that flawless fronts can hide the darkest secrets. Now, she must race against the clock to uncover the truth. Who would want to kidnap such a family? And how far would they be willing to go? "Pain has a flavour. It tastes like oranges." So says Libby Denbe at the start of suspense queen Lisa Gardner's latest dark and twisted thriller. Libby is a Boston wife on a downward spiral, when a 'save-our-marriage' date night ends in a traumatic kidnapping of her entire family. Meanwhile state trooper turned private investigator Tessa Leoni is trying to get her life back on track after her husband's death, and now must help another broken family in trouble. Leoni returns after debuting in Gardner's 2011 thriller LOVE YOU MORE, a tale where her own family life imploded with terrible consequences. Now she is hired by Justin Denbe's wealthy construction firm to help the police and FBI try to find the missing family. There's very little to go on: no witnesses, no ransom demands, no clues. A family with a seemingly perfect life - happy marriage, beautiful teenage daughter, beautiful house, financially secure - just disappears. Who has taken the Denbes, and why? As time ticks by, fears grow. Gardner intercuts scenes of what the family is going through with Leoni and the other investigators trying to chase a near-invisible trail. First-person and third-person perspectives. Cracks in the perfect veneer appear, then widen. Secrets begin to come to the surface. Leoni is determined to find the family and find the truth, but is she also looking to atone for her own past sins? Many of the main players in TOUCH & GO are flawed and often not particularly likable, but they're interesting and engaging. It's easy to get drawn into the action, hooked early and powering through the pages to find out what will happen. Gardner is one of the finest bestsellers around when it comes to penning highly suspenseful thriller tales that weave plenty of character oomph into twisting, pacy plotlines. She has a masterful touch for tension, keeping readers on the edge throughout, but it is in the evocation of her complex, layered characters where her talents shine brightest. Longtime Gardner fans will be pleased to get a small cameo from series detective DD Warren, and it's interesting to see how Leoni has evolved from LOVE YOU MORE, including a budding new relationship. Overall this is a very good read that ticks boxes across the board. 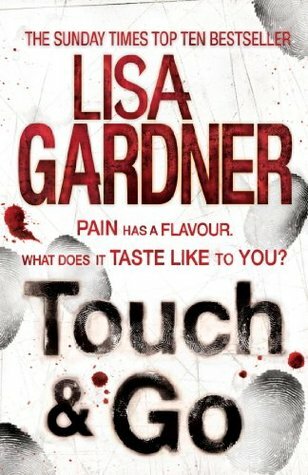 This is an expanded version of my review of TOUCH & GO published as part of my crime fiction round-up in the Herald on Sunday newspaper on Sunday 17 March 2013.